You have a tendency to go a bit crazy so you make a list and stick to it. That way you return home with the toilet rolls and milk and only toilet rolls and milk, rather than augmenting your shopping trolley with a six pack of beer and a new flat screen television set. You always forget something – without a list you’ll be taking your coffee black and wiping… well, enough said. Top Tip: Only put items you actually need on your list. Here are a couple of lists I made earlier. Note the poor handwriting – an unreadable list is useless! For example, on the top list, the very top item reads “pizzas”, not “pixies”, and the fourth item down on the left is “pickled onions” rather than “disabled chins”. Imagine what a fool you would feel when asking the shop assistant where the disabled chins are! The pixies, however, are to be found in aisle three, apparently. Top Tip: Write legibly – an unreadable list is a useless list, and could lead to embarrassment! To make your list, any spare piece of paper may be used. There’s no hard and fast rule, but I like to use a paper block. I’m currently using one I got while on my holiday in Wales – take a look below. See how it cleverly it opens up to reveal the paper within! It’s a great source of paper and when not in use, a great decoration for your coffee table. 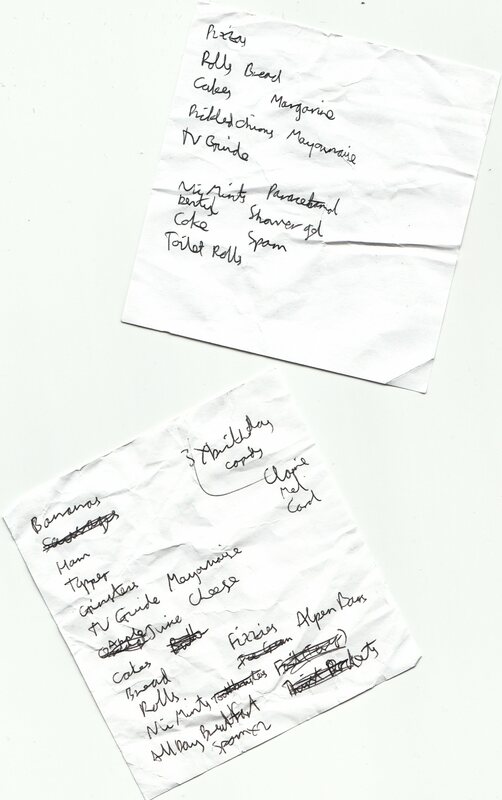 Top Tip: Use a piece of “paper” to write your list on. On the lower list, see how I’ve cleverly reused the list by scribbling out the items I no longer need. Top Tip (advanced): When reusing a list, you may also add new items. In this case, I have added “birthday cards”. Finally, be sure to think carefully before making your shopping list. Try to list the items in the order they appear in the shop, not in the order in which they appear in your head. Take a look at the illustrations below. The route on the left was followed by someone using a well-thought-out list. The route on the right… well, I think it speaks for itself! Top Tip: Save time by planning your list so that the items appear in the correct order. I hope that this guide will prove useful to those of you who plan on embarking on designing, and using, lists. Remember, lists can be fun to make, and useful too! Lists are my lifeline. So I would add a tip. I generally just chuck items randomly onto the page. Ah, I see! I’m a bit of a mint fanatic and I thought I was missing out on something (I just discovered today that in the States, Polos are called Lifesavers), but no . . . am not missing out on nicotine mints. Oh yes – even now I didn’t make the connection! I always assumed Lifesavers were some sort of “Fishermen’s Friends” type of thing. No idea why. Also, I’ve heard lifesavers are called lifesavers because you aren’t supposed to be able to choke on them. I guess theoretically it gets stuck in your throat and you can still breathe through the hole? I’m not sure if this is true or not as I’ve never tried it. But I can say that for sure the wint-o-green ones spark if you chew them in the dark. Now that’s a very good point! I can’t remember the last time I chewed sweets in the dark in front of a mirror. Can you believe that? Problem with lists for me is once I am shopping I don’t like what’s on my list. I get bored with food and always want something new. Nice mints, I recently quit smoking using those. Hardest thing I have ever done. Don’t quit everything! You need to keep some little luxuries for yourself. Oh I like your handwriting! Spam is meat right? I love how Pizza’s is on the top of your list! If you ever go for PM in Engeland I will force people to vote for you. Ah.. imagine.. world pizza..
Spam is meat, sort of 🙂 – “spiced ham” I think the name came from. It’s all mashed up and processed and whatnot. Just found you . Will try to browse a bit.